In 2011, I gave birth to a wonderful baby boy. I was never prepared for what was to come (are any new Mothers!?). We had nursing issue after issue, and he struggled with various stomach issues. We attempted the liquid gold formula (aka the dairy free formula) but he resisted with a determination and deprived his parents of sleep. I ended up giving up all dairy and soy, and we soon found our happy ground (until teething began… but that is for another blog post). 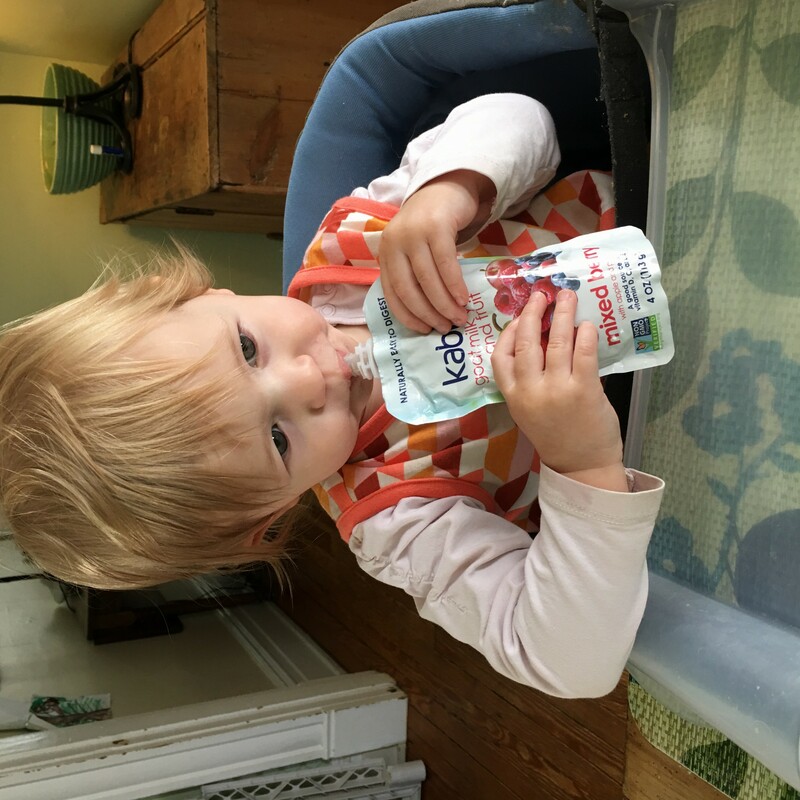 This brings be to Kabrita USA… a dutch company founded in 2015 by two Moms that knew all too well my struggles as a new mom (read their story here). Doctor Kate Morrison knew that goat’s milk was naturally easy to digest, and is more like human milk than other available alternatives. The goat milk protein found in Kabrita Toddler Formula forms a softer curd in the stomach than cow milk protein. Goat milk curd is actually quite similar to the curd formed from human milk. Because of this, it passes through the stomach and intestines at a similar rate to human milk, so it’s nice and gentle on the tummy. I wish that this product had been around when my son was a baby and toddler. 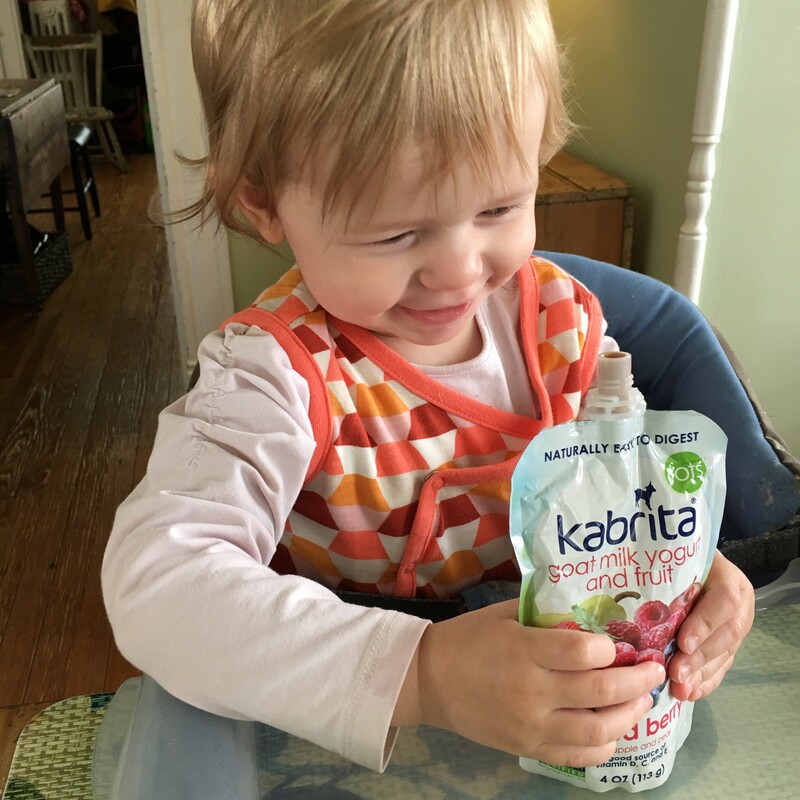 And I hope that all of you that have children with cow milk sensitivity or are looking for an alternative to cow’s milk give Kabrita Toddler Formula a try. Daisy loved the yogurt that is conveniently packaged in the easy to use anywhere tubes. She is pictured here eating Kabrita Goat Milk Yogurt and Fruit: Mixed Berry. She was so crazy for the Kabrita Goat Milk Yogurt and Fruit: Mango and Peach we ordered more from amazon. Last week we had strep and the only thing she would eat was the Kabrita Goat Milk Yogurt and Fruit: Mango and Peach. My guess is that between the stomach issues and he sore throat that she knew what was easy on her stomach, and we trusted her to know what her body needed. Kabrita Goat Milk Toddler Formula is available for purchase at Kings Food Markets, select Whole Foods Markets, select independent health and natural food stores, diapers.com, amazon.com, and kabritaUSA.com.